Fig.1. Mrs. Dalloway, with the 6-degree path from Maisie Johnson to Perkins in red. For the sake of consistency, I have not included conversations that occur in analepsis in any of my network statistics. Since such interactions are so important in Mrs. Dalloway, however, they are indicated here with dotted blue lines. 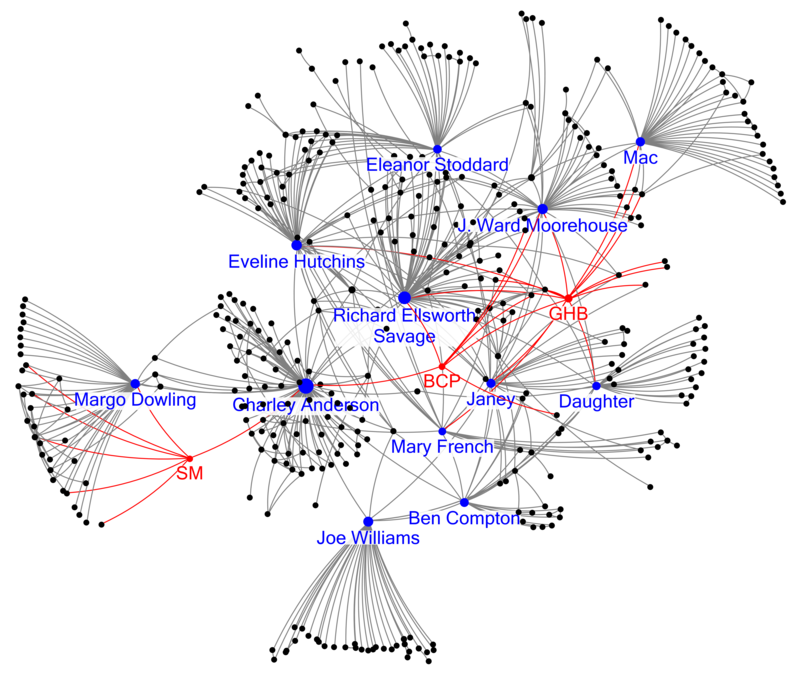 The four nodes to the left of Clarissa’s network, which are highlighted in purple, represent a separate connected component consisting of Ellen Barnett, Lady Lovejoy, Alice Lovejoy, and Mr. Wilkins, who have a side conversation at Clarissa’s party. As Franco Moretti has shown, a narrative can be represented as a social network if characters are plotted as nodes and connected (with an edge) when they speak to each other. Once the character relations in a novel have been mapped in this way, we can measure the geodesic distance between any two characters as a count of the smallest number of steps necessary to connect them (or the degrees of separation between them). 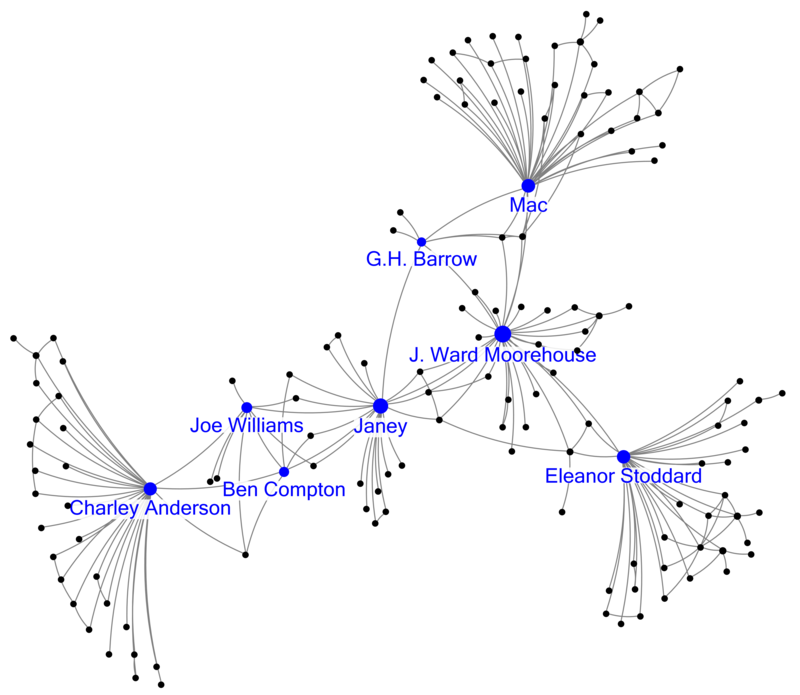 Figure 1, for example, represents the social network of Mrs. Dalloway and traces in red the six steps that are necessary to connect two maximally distant characters: Maisie Johnson, a young woman who has just arrived in London at the beginning of the novel, and Perkins, Lady Bruton’s cook. Maisie and Perkins never speak to each other, but they are connected by the conversation partners of their conversation partners in six steps that correspond to six interactions in the novel. 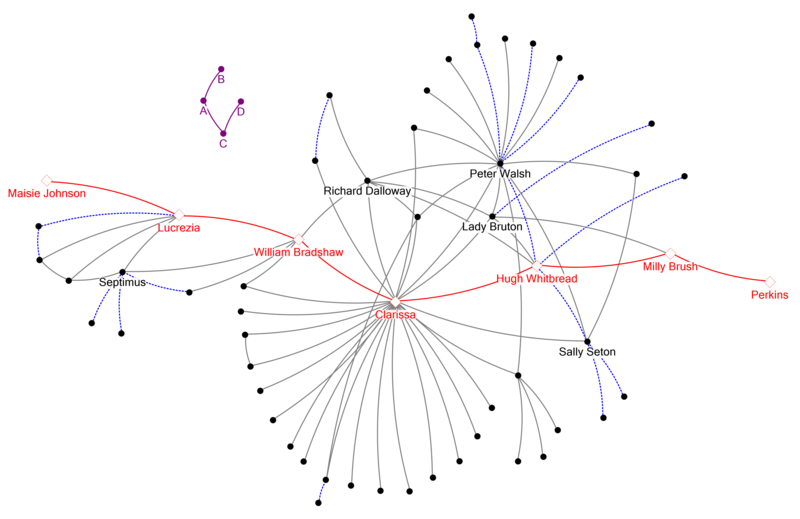 Moving from left to right on the network map, rather than chronologically through Woolf’s plot, those interactions are as follows: (1) Maisie asks Lucrezia for directions; (2) Lucrezia speaks to William Bradshaw, her husband’s psychiatrist; (3) Bradshaw speaks to Clarissa Dalloway at Clarissa’s party; (4) Clarissa speaks to Hugh Whitbread when she runs into him on the street; (5) Hugh speaks to Lady Bruton’s maid, Milly, at lunch; and (6) Milly instructs Perkins to make coffee. This is the shortest path between Maisie and Perkins, and no shortest path between any pair of characters in the novel is longer; thus, the maximum geodesic distance of Mrs. Dalloway, which is also called its network diameter, is 6. Fig. 2. 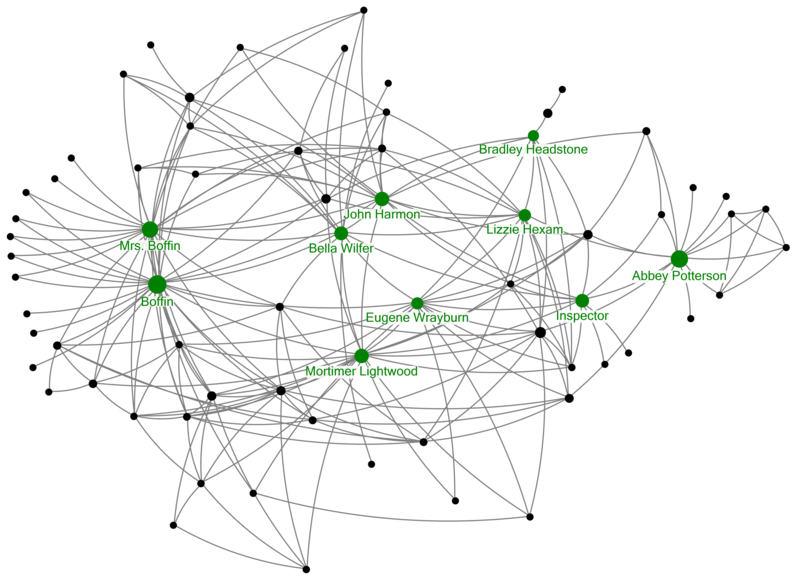 Our Mutual Friend, weighted by betweenness centrality, with top ten characters labeled. Precisely because it is so sensitive to outliers, network diameter offers an effective way to measure the social scale of a novel. The six-degree path I have just sketched, for instance, spans the major social realms represented in Mrs. Dalloway, passing from the lower-middle-class milieu of the Warren Smiths, through Clarissa’s “network of visiting, leaving cards,” as Peter Walsh calls it, to the world of the servants. And when measured by the standard of network diameter, the social scale of a novel does not seem to be strictly determined by its length. Dickens’s Our Mutual Friend, for example, is a Victorian behemoth whose title and multiple intersecting plots have made it attractive to critics interested in narrative networks. Yet even though it is more than seven times as long as Mrs. Dalloway, Dickens’s novel also has a network diameter of 6 (see Figure 2 for a network map of Our Mutual Friend and Figure 3 for a table containing network metrics for all of the novels considered here). The six degrees of separation that was an average social distance in Stanley Milgram’s famous “small world” studies is an upper limit for these fictional networks. “Time turned into space,” Moretti calls narrative network maps like the one I have been discussing, but what is the nature of this abstract space (Distant Reading, 82)? The distance measured by a network diameter is not really built of time, nor even of narrative events (the conversations that connect characters); rather, this “longest shortest path” is a measure of disconnection and a count of missing events—of conversations that do not happen. Maisie and Perkins would be separated by a geodesic distance of 1 if they spoke to each other in the novel, by a geodesic distance of 2 if, after speaking to Maisie, Lucrezia spoke to Perkins, and so on. To say that Maisie and Perkins are “socially distant,” therefore, is really to tally the many possible acts of communication that do not occur. This may seem an odd calculation to make, yet I would argue that readers perform an intuitive version of it as they move through a network narrative like Our Mutual Friend, Mrs. Dalloway, or Dos Passos’s U.S.A., the third novel I will discuss here. David Bordwell defines the network narrative as one in which the characters “have diverging purposes and projects, and these intersect only occasionally—often accidentally,” such that readers or viewers “construct not an overarching causal project but an expanding social network” (Poetics of Cinema, 191, 193). As Bordwell’s emphasis on chance and accident makes clear, a felt sense of probability is essential to the experience of such a text. Both the pleasure and the believability that result from an unexpected intersection of plotlines depend on our awareness that many other possible intersections will never materialize. Fig. 3. Whole-network statistics for Dickens, Woolf, and Dos Passos. What a narrative network diagram shows us, then, is a cognitive map of a novel’s social world, which models readers’ judgments about what connections are plausible within that world. The “chance encounters” that usually dominate discussions of network narrative are important to this social map, but so too are the missed encounters that account for the white space in the network diagrams included here (Gibson, “Our Mutual Friend and Network Form,” 65.). That modernists like Woolf and Dos Passos themselves emphasize this kind of negative social space becomes clear in the metric of network density. Network density is computed by dividing the total number of actual edges in a network by the total number of possible edges—in other words, by dividing the number of communications between characters in a novel by the number we would get if every single character communicated with every other character. In Mrs. Dalloway, 5.9% of possible connections are realized. Woolf’s novel is thus 36% less connected than Our Mutual Friend, in which 9.2% of connections are realized. The first volume of U.S.A. (with 2% network density) presents an even less connected narrative world, and in the U.S.A. trilogy as a whole less than 1% of possible connections are actualized. These numbers draw on the ability of computational analysis to calculate the unrealized possibilities of a plot, and they reveal the different uses to which Dickens and his modernist successors put the network narrative. For Dickens, a densely connected web of relationships is a way of undermining social hierarchy by exposing hidden connections between different social worlds. By contrast, Woolf and Dos Passos use an unusually large number of one-degree characters (those who communicate with only one other person in the novel) to create porous networks, increase the distances between characters, and expose social gaps that are virtually unbridgeable. Just as the upper-class “network of visiting, leaving cards” is at the center of Mrs. Dalloway, a network of profitable “contacts” anchors Dos Passos’s story of a rising American empire. By insistently focalizing characters who are as peripheral to these power networks as they are to the novels’ major plotlines, Woolf and Dos Passos invite readers into the experience of the socio-narrative margin. My claim that the modernist novel, especially one by Woolf, covers a social distance comparable to that of the “loose, baggy monsters” of Victorian fiction challenges not only received ideas about modernism but also more recent applications of network analysis to the novel. Discussing his own network map of Mrs. Dalloway, for example, Graham Sack claims that “[w]hile mid-Victorian novels often featured sprawling casts, the network for Mrs. Dalloway, a canonical work of high British modernism, is delimited. The focus is on psychological depth rather than sociological breadth.” Sack’s claim here depends on a very particular set of requirements for inclusion in the “cast” of the novel. An individual counts as a character (or node) in his analysis if he or she is linked to another character, and a link is established not by the act of conversation but by collocation (the co-appearance of two characters within a defined number of words). Crucially, Sack links characters only if their names occur within 10 words of each other at three or more points in the novel. This last condition makes sense when we consider how a 10-word co-occurrence standard on its own would distort the plot of Mrs. Dalloway—for example, by linking Clarissa and Septimus, who never speak or even appear in the same place but are in one striking passage separated by 9 words (and part of London). But in filtering out such instances Sack’s requirement also erases anyone who speaks fewer than three times, and it turns out that such characters make up nearly half the speaking population of Woolf’s novel. The network I constructed by reading the novel and linking characters who engage in verbal communication in the diegetic present (not in flashbacks) includes 47 unique characters, as compared to Sack’s 24. By comparison to Our Mutual Friend (analyzed using the same method), Mrs. Dalloway is in fact a remarkably populous novel, with one character per 1,300 words as compared with one per 7,000 or so in Dickens. Populous but disconnected: this is the picture of Woolf’s character-system that emerges from such statistics. 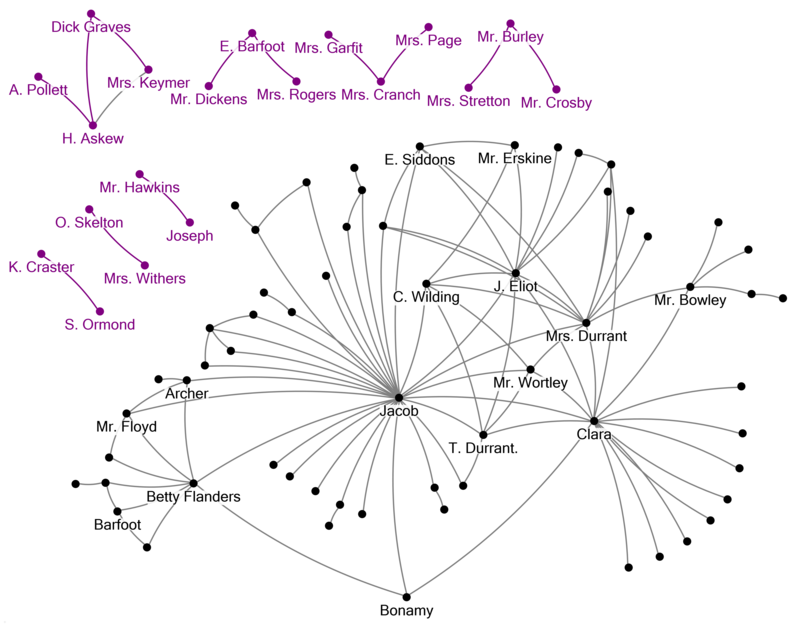 Far from an oddity to be controlled for in network analysis, characters with a low degree (i.e., those who are not shown speaking to many other people) are a distinctive element of the modernist style that Woolf developed in this phase of her career. One-degree characters like Perkins and Maisie Johnson, in fact, account for 53% (25 of 47) of the named characters in Woolf’s network, as compared to only 20% (14 of 70) in Our Mutual Friend. The discursive space that Woolf uses to develop such individuals and document their conversations is, of course, space not devoted to more central characters; in this sense, Woolf intensifies what Fredric Jameson calls a “centrifugal tendency” in realism that leads “secondary characters to move forward and to eclipse the relationships of the main characters.” This tendency is especially marked in the case of Maisie, who abruptly usurps the narrative perspective in the midst of one of Septimus’s most intense exchanges with Lucrezia. Even though the nineteen-year-old Maisie appears only once in the novel and speaks only to Rezia, the narrative swells to accommodate her entire lifespan in a page-long aside that details her recent move to London and imagines the moment fifty years hence when she will “make it jangle again among her memories how she had walked through Regent’s Park on a fine summer’s morning” (Woolf, Mrs. Dalloway, 26). Fig. 4. Unweighted network map for Jacob’s Room. Connected components not attached to the main component centering on Jacob are highlighted in purple. Woolf experiments more extensively with this kind of prolepsis in her previous novel, Jacob’s Room, a brief analysis of which can help us gauge the balance of connection and non-connection (negative space, or social distance) in Mrs. Dalloway. About 10,000 words shorter than its successor, Jacob’s Room nonetheless has a wider network diameter (7) and includes more speaking characters (with 82 nodes). 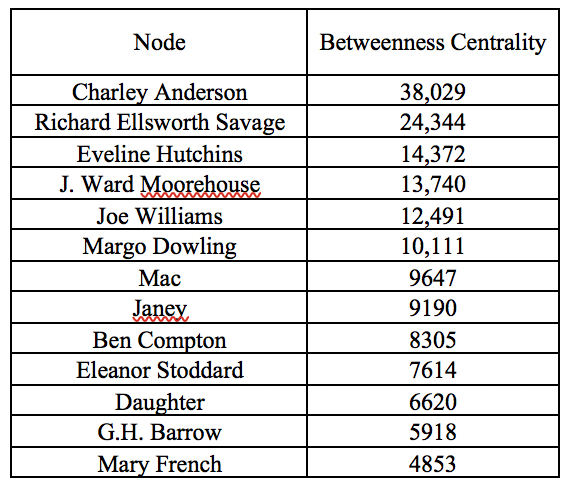 As we would expect, the network that links these nodes is even less connected than that of Mrs. Dalloway (with a network density of 3.4% as compared with 5.9% in Mrs. Dalloway); however, a more striking difference involves the number of connected components in each novel. A connected component is a kind of sub-network, a set of nodes on a network graph within which any two nodes can be connected—even if only by a path that traverses many intermediaries. If there is no possible path between two nodes, then they belong to separate components. In Mrs. Dalloway, there are two connected components. The main component, with Clarissa at its center, connects all the speaking characters in the novel with the exception of four characters who form their own component and are represented in the upper left quadrant of Figure 1. These nodes are (A) Ellen Barnet, who greets (B) Alice Lovejoy and (C) her mother, Lady Lovejoy, who in turn speaks to (D) “Mr. Wilkins (hired for parties)” (167). These characters appear only at Clarissa’s party, and are not shown communicating to any other characters, so they represent a distinct connected component. By contrast, Jacob’s Room includes 8 such components: the main one that centers on Jacob and the 7 that surround it and are highlighted in purple in Figure 4. One of these, for example, consists of Ellen Barfoot—Captain Barfoot’s invalid wife—and the two people to whom she speaks in the novel (neither of whom, tellingly, is Captain Barfoot). The character network in Mrs. Dalloway is less fractured and more densely connected than the one in Jacob’s Room. To read this tightening-up as a honing of Woolf’s narrative technique, however, would seem an arbitrary aesthetic judgment along the lines of early critics’ determination that Mrs. Dalloway itself is not connected enough because Septimus’s and Clarissa’s plotlines never cross. It seems more likely that the greater connectedness of Mrs. Dalloway has to do with Woolf’s effort to “criticise the social system, & to show it at work,” as she wrote in her diary, and that social power here translates as narrative connection. The centrifugal impulse that still operates at the level of discourse in Mrs. Dalloway (in the inclusion of a perspective like Maisie’s, for instance) is counter-balanced and reined in by a centripetal story that links up nearly all the characters into a single network in which some are more distant than others from the center. The novel’s social critique lies in the combination of the wide social distance Woolf had already built up in Jacob’s Room with a network that still ultimately holds together as one. This structural coherence is realistic, since all network boundaries in the real world are in the final analysis arbitrarily imposed (relations really do stop nowhere, as Henry James said), but it is also tragic, since the center of the novel’s narrative network is also a locus of power and influence that some characters can never access. Fig. 5. The 42nd Parallel, weighted by betweenness centrality, with the top eight characters labeled. A similar counterpoint of distance and connection is at work in Dos Passos’s U.S.A. This trilogy shows how modernism transformed the network narrative, since it is similar to Our Mutual Friend (a possible influence on Dos Passos) in its multi-protagonist plot and single-component network, but resembles Mrs. Dalloway in its large cast of widely spaced characters. Indeed, despite all the critical attention to the “network of crisscrossing characters” in U.S.A., here even more than in Woolf’s novel the crossings of major characters are less remarkable than the vast empty spaces that separate them (Beal, “Network Narration”). Only around 1% of possible connections are realized in the novel’s network, which has a diameter of 8. This scale is not a byproduct of the trilogy’s length. The first volume alone (The 42nd Parallel, which is about one-fourth the length of Our Mutual Friend) has already grown to the eight-degree diameter that will characterize U.S.A. as a whole. The 42nd Parallel includes 142 named characters, more than appear in either Mrs. Dalloway or Our Mutual Friend, and those characters are widely separated. In this volume, average geodesic distance (the shortest path, on average, between nodes) is 3.8—significantly higher than Woolf’s 2.6 or Dickens’s 2.9, and moving in the direction of the Milgram number that for the other two novels is a maximum rather than an average. Like Mrs. Dalloway, The 42nd Parallel owes its scale in large part to one-degree characters, who make up 46% of the novel’s total cast. As the shape of the network in Figure 5 shows, U.S.A. is an engine for producing such characters. Each of the five protagonists named in the table of contents for the first volume (and ultimately each of the 12 protagonists in the trilogy) is the subject of a compressed bildungsroman and thus the hub of a wheel-like “egocentric network” of connections, many of them to one-degree characters. Fig. 7. Betweenness centrality in The 42nd Parallel. Note the 76% decrease between the top eight characters (including Barrow) and the rest of the characters in the novel (beginning with Doc Bingham). In creating such an enormous fictional population, Dos Passos invites comparisons between the character network of U.S.A. and the social network of the country named in the novel’s title. As Mark Mizruchi shows in his groundbreaking network analysis of corporate boards in the early twentieth century, the elite social network at the heart of American power in the years covered by U.S.A. was “tightly connected and . . . dominated by corporations associated with the interests of the major capitalists.” The posited center of that network is the real protagonist of U.S.A., not any one character, and the fact that some characters get closer to it than others helps account for the disparities in network centrality among Dos Passos’s characters. A number of metrics have been developed to assess which nodes are the most central to a given network. Degree centrality, for example, simply ranks nodes based on how many connections they have. Betweenness centrality is a measure of how often a node lies on the shortest path between two other nodes, and so helps determine how essential a character is to the structural coherence of a narrative network. Clarissa has (by far) the highest betweenness centrality in Mrs. Dalloway, for example, because the shortest path between any pair of characters is most likely to pass through her (as it does in the case of Maisie and Perkins) (see fig. 6). The characters who score highest on this metric in U.S.A. make themselves central both to the plot of the novel and to their social network through deliberate “networking.” This bit of jargon was not available to Dos Passos, of course, but he refers repeatedly to his characters’ cultivation of “contacts”—as in, “Harvard stood for the broad a and those contacts so useful later in life.” J. Ward Moorehouse, for example, has the highest betweenness centrality in The 42nd Parallel. Like several of the trilogy’s protagonists, Moorehouse comes from a middle-class family, but through successive marriages to wealthy women is able to “make many contacts in different branches of the casting and steel and oil industries” (Dos Passos, The 42nd Parallel, 256). This personal network in turn establishes Moorehouse as a public relations executive who specializes in facilitating “friendly contact” —i.e. collusion—between politicians like Bowie C. Planet and corrupt labor leaders like G. H. Barrow (272). Fig. 8. 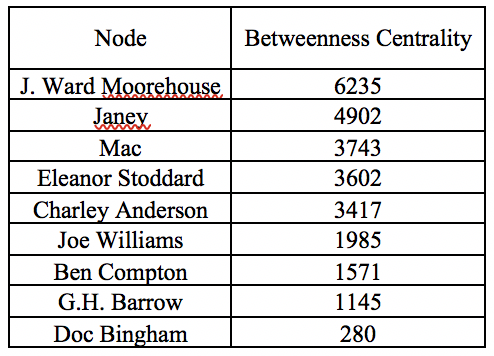 Betweenness centrality in U.S.A.
Barrow himself illustrates the extent to which narrative centrality in U.S.A. aligns with socioeconomic centrality. Though he is not a named protagonist, Barrow is one of the eight characters in The 42nd Parallel with the highest betweenness centrality, the other seven of whom either have been or will be named as protagonists by the chapter titles in U.S.A. (see fig. 7). Between this top eight and the rest of the characters in The 42nd Parallel, there is a 76% decrease in betweenness centrality, so it seems fair to isolate them as a kind of top tier of central characters. Barrow’s appearance in that tier is purely a function of his social connectedness. An accomodationist labor leader (“laborfaker”), he is more interested in women and his career than in the problems of the working class (Dos Passos, The Big Money, 552). Barrow says at one point that he is “anxious to establish contacts,” and he does so successfully enough to become a major bridging figure in U.S.A. (Dos Passos, 1919, 669). As Figure 8 shows, in fact, Barrow bumps one of the 12 protagonists of the trilogy (Mary French, who makes actual sacrifices for the labor movement and comes to loathe him) off the list of characters with the highest betweenness centrality. Even as he allows an ambitious non-protagonist like Barrow to muscle his way into the center of his narrative network, Dos Passos apportions a greater share of the novel’s discourse to protagonists who are peripheral to that network. These characters, visible on the outskirts of the network map for the trilogy as a whole (fig. 9), include Joe Williams, the merchant sailor whose life is a monotonous slog from port to port; Mac, the communist Irish-American printer and the first protagonist introduced in the trilogy; and Margo Dowling, who is a member of a different kind of working class. Margo is a silent film actress whose trade, like Mac’s, is vulnerable to technological upheaval; she is entirely dependent on men like Sam Margolies (the film director whose network is highlighted in red in Figure 9) and Charley Anderson for access to capital and influence. Charley, who has an affair with Margo, has the highest betweenness centrality in U.S.A. He is “the coming contactman” in aircraft engineering, and he achieves success exactly as Moorehouse does: by making inroads to the established network of American power through an advantageous marriage and the patronage of Bowie C. Planet (Dos Passos, The Big Money, 90). Moving into a closer orbit around the center of American capitalism does not make Moorehouse or Charley happier, and to a certain extent they are victims of their social network as much as Mac, Joe, or Margo. At the end of U.S.A. both are miserable, and Dos Passos emphasizes that both have grown fat—a hint that they, like the overweight and aptly named Senator Planet, now represent a gigantic distortion of social and economic space. Fig. 9. Network map for U.S.A., with characters weighted by betweenness centrality and the top 12 characters (plus Mary French) labeled. Highlighted in red are Sam Margolies, Bowie C. Planet, and G.H. Barrow, with their connections. As Dos Passos closes U.S.A., he makes his network more connected by bringing back characters who have not been seen since they appeared in earlier volumes: Moorehouse, Doc Bingham (now an herbal medicine magnate), and G. H. Barrow all return in the final chapters. The fact that only wealthy and connected characters return suggests that in U.S.A., as in Mrs. Dalloway, narrative connection embodies the force of social networks as aggregators of power and influence. Less connected characters like Mac and Joe Williams, and by extension their one-degree connections, have gone missing. That those networks have been presented so extensively before being closed off is a part of the radically democratic style of modernist fiction, its insistence that the novel is capable of representing “anyone at all.” This premise of equality is one that Woolf and Dos Passos share with network analysis. As the creators of NodeXL emphasize, “A full or complete network contains all the people or entities of interest and the connections among them. All egos are treated equally” (Hansen, Shneiderman, and Smith, Analyzing Social Media Networks, 36, emphasis in original). Ultimately, this ambitious agenda comes up against the problems that Woolf articulates in Jacob’s Room: a complete network is never really possible, “one has to choose” focal characters, and that choice is bound to be arbitrary—or even to reproduce social hierarchy. Both by multiplying their characters and by minimizing the density of the relations between them, Woolf and Dos Passos embed their plots in a vast social space that reminds readers of this inevitable act of exclusion. Caroline Levine, Forms: Whole, Rhythm, Hierarchy, Network (Princeton, NJ: Princeton University Press, 2015), 127, 129. In addition to Levine, see Anna Gibson, “Our Mutual Friend and Network Form,” Novel: A Forum on Fiction 48, no. 1 (2015): 63–84, Jonathan H. Grossman, Charles Dickens’s Networks: Public Transport and the Novel (Oxford: Oxford University Press, 2012), and Franco Moretti, Distant Reading (New York: Verso, 2013), 210–40. Though it differs from these accounts in treating the network novel as a distinctively “late twentieth-century genre,” Patrick Jagoda’s Network Aesthetics (Chicago, IL: University of Chicago Press, 2016) shares their assumption that network narrative largely bypassed modernism (43). Virginia Woolf, Mrs. Dalloway (New York: Harcourt, 1981), 112. Approximate word counts for the novels discussed here are as follows: Our Mutual Friend: 476,351; Mrs. Dalloway: 64,023; Jacob’s Room: 54,424; narrative portions of The 42nd Parallel: 116,059. Henry Field, Assistant Professor of Computer Science at Endicott College, helped me with word counts and a number of other issues related to the data analyzed here. For a very different application of this concept to Dos Passos’s U.S.A., see Wesley Beal, “Network Narration in John Dos Passos’s U.S.A. Trilogy,” Digital Humanities Quarterly 5, no. 2 (2011). Henry James, Preface, The Tragic Muse, vol. 1 (New York: Scribner, 1908), x.
 Graham Alexander Sack, “Character Networks for Narrative Generation: Structural Balance Theory and the Emergence of Proto-Narratives,” in Complexity and the Human Experience: Modelling Complexity in the Humanities and Social Sciences, ed. Paul A. Youngman and Mirsad Hadzikadic (Boca Raton, FL: CRC Press, 2014), 81–104, 87. See Sack, “Character Networks,” 85. “Clarissa Dalloway laid her green dress on her bed, and the Warren Smiths walked down Harley Street” (Woolf, Mrs. Dalloway, 94). Since direct speech makes up only a fraction of the communication that characters exchange in a novel, I have also linked characters who communicate through the two other two modes of fictional speech—narratized speech and transposed speech—that Gérard Genette identifies in Narrative Discourse: An Essay in Method, trans. Jane E. Lewin (Ithaca, NY: Cornell University Press, 1980), 171. To account as comprehensively as possible for the verbal communication in these novels, I found it necessary to make only two additions to Genette’s taxonomy: (a) written communication, and (b) the privileged narrative speech act of the formal introduction. For my rationale, see the cover page to my data sets, where I also include the page number and speech type for each interaction. My method here defines a character as a named individual who speaks to another individual. A limitation of this approach is that it does not include what might be called unconnected nodes, who appear and are named, and often think at length in the novel, but speak to no one. At the beginning of Mrs. Dalloway, for example, Scrope Purvis contemplates Clarissa Dalloway unobserved, but never speaks to her or anyone else in the novel (4). By my count, there are 10 such characters in Mrs. Dalloway. For a definition of the term “character-system,” see Alex Woloch, The One vs. the Many: Minor Characters and the Space of the Protagonist in the Novel (Princeton, NJ: Princeton University Press, 2003), 14. The move from the more traditional courtship narratives in Woolf’s first two novels to her experimental novels of the 1920s is accompanied by a dramatic increase in the proportion of one-degree characters: from 10% in The Voyage Out (1915) and 15% in Night and Day (1918) to 50% in Jacob’s Room (1922) and 53% in Mrs. Dalloway (1925). Even in the novels that focus on family life in a nonurban setting, one-degree characters make up a comparatively high proportion of the total cast: 39% in To the Lighthouse (1927) and a striking 61% in Between the Acts (1941). Fredric Jameson, “Afterword: A Note on Literary Realism,” in A Concise Companion to Realism, ed. Matthew Beaumont (Malden, MA: Wiley-Blackwell, 2010), 279–89, 287. For a discussion (and correction) of this view, see Alex Zwerdling, Virginia Woolf and the Real World (Berkeley: University of California Press, 1986), 132. Virginia Woolf, The Diary of Virginia Woolf, vol. 2, ed. Anne Olivier Bell and Andrew McNeillie (New York: Harcourt Brace Janovich, 1978), 248. This passage is also quoted by Zwerdling, who makes it the basis of his influential chapter on the novel (Virginia Woolf and the Real World, 120). Henry James, Preface, Roderick Hudson, vol. 1 (New York: Scribner, 1907), vii. Dos Passos acknowledged the influence of Thackeray’s Vanity Fair on his novel, but Our Mutual Friend seems to me to be an equally important Victorian model. Like Dickens, Dos Passos uses the party as a device for introducing disparate characters. Three of the four volumes of Our Mutual Friend end with parties, just as all three volumes of U.S.A. do. The modernist influence on Dos Passos probably emanates less from Woolf than from Joyce, who makes a similar use of social distance in key parts of Ulysses. Donald Pizer also focuses on what he calls Dos Passos’s “interlacing” technique in Toward a Modernist Style: John Dos Passos (New York: Bloomsbury, 2013), 45. For the concept of an egocentric network, see Derek Hansen, Ben Shneiderman, and Marc A. Smith, Analyzing Social Media Networks with NodeXL: Insights from a Connected World (Burlington, MA: Morgan Kaufmann, 2010), 36. Mark S. Mizruchi, The American Corporate Network, 1904–1974 (Beverly Hills, CA: Sage Publications, 1982), 99. John Dos Passos, U.S.A.: The 42nd Parallel, 1919, The Big Money (New York: Modern Library, 1937), vol. 1 (The 42nd Parallel), 452. Jacques Rancière, The Politics of Literature, trans. Julie Rose (New York: Polity Press, 2014), 12. Virginia Woolf, Jacob’s Room (New York: Harcourt, 1960), 69.